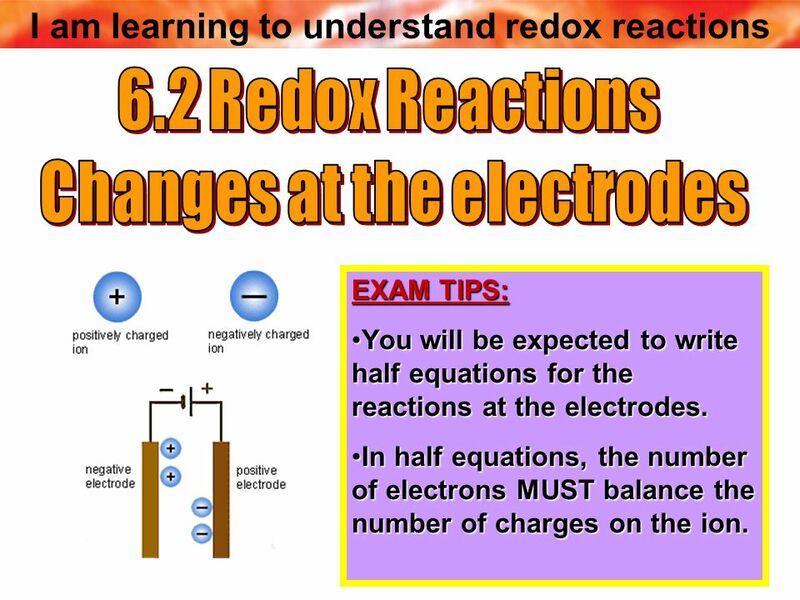 6.2 Redox Reactions Changes at the electrodes EXAM TIPS: You will be expected to write half equations for the reactions at the electrodes. In half equations, the number of electrons MUST balance the number of charges on the ion. • That electrons are transferred during electrolysis. • That electrolysis can be represented in half equations. • That water affects electrolysis. 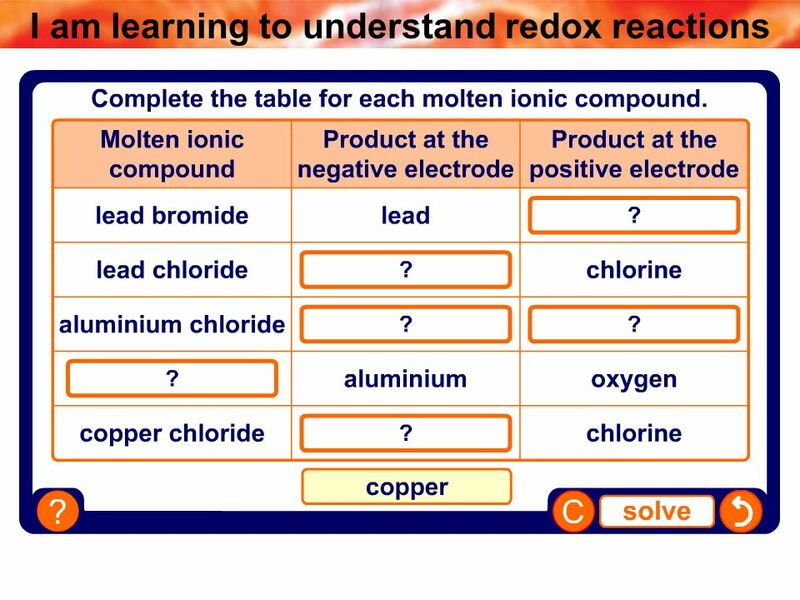 Outcomes: I will demonstrate I understand at Grade C by • Recall the transfer of electrons at the anode and cathode. 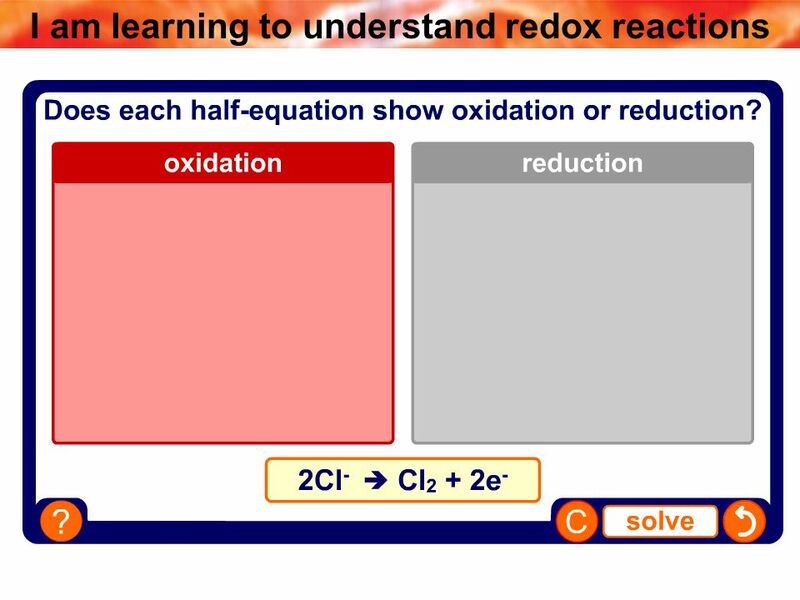 • Recognise oxidation and reduction at electrodes. • Predict the products of electrolysis. 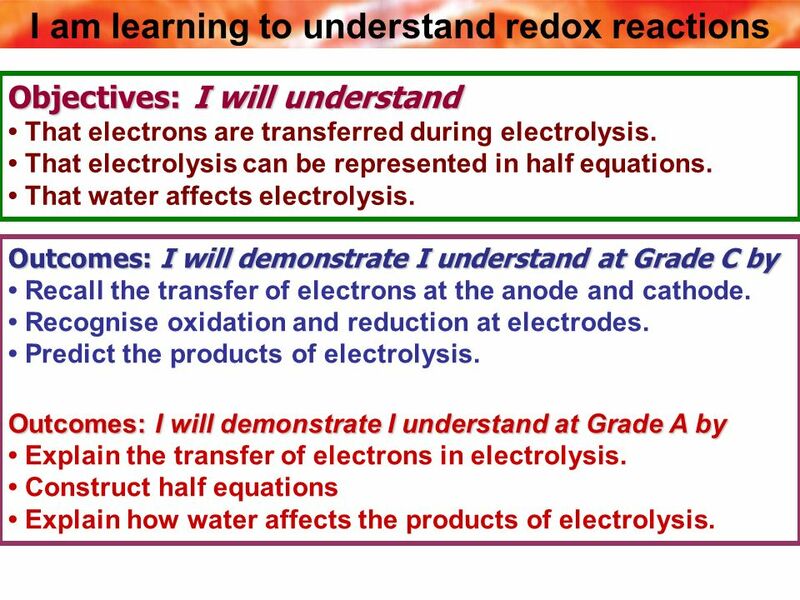 Outcomes: I will demonstrate I understand at Grade A by • Explain the transfer of electrons in electrolysis. • Construct half equations • Explain how water affects the products of electrolysis. 3 Do you remember what goes where? 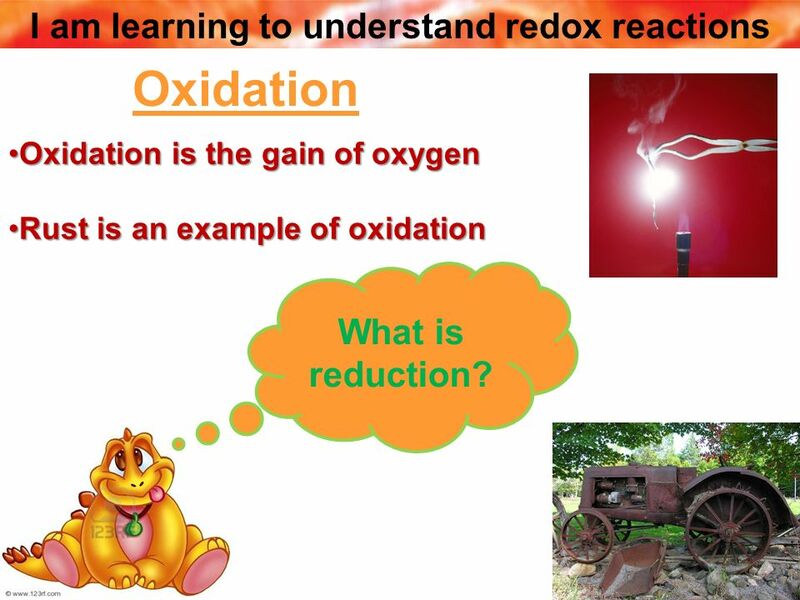 Rust is an example of oxidation What is reduction? 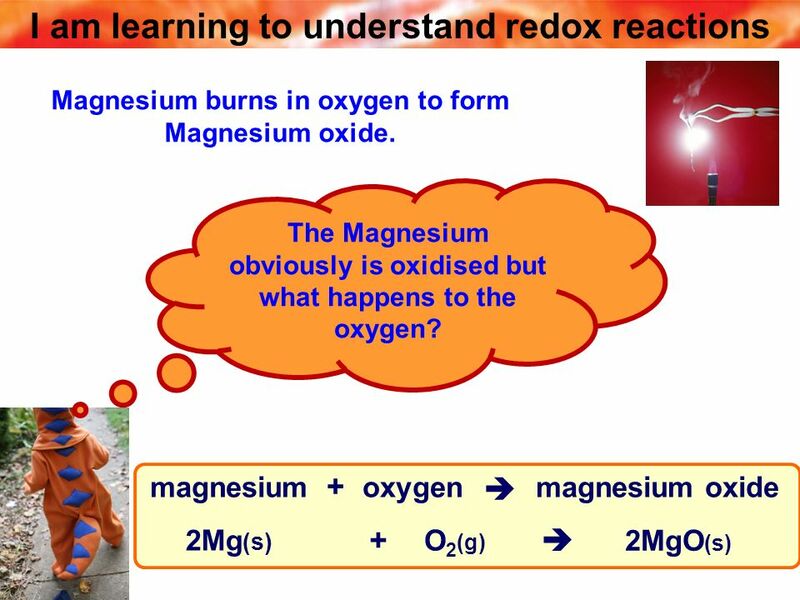 8 Why is this type of reaction called a redox reaction? 17 Can you role-play what happens at the electrodes? 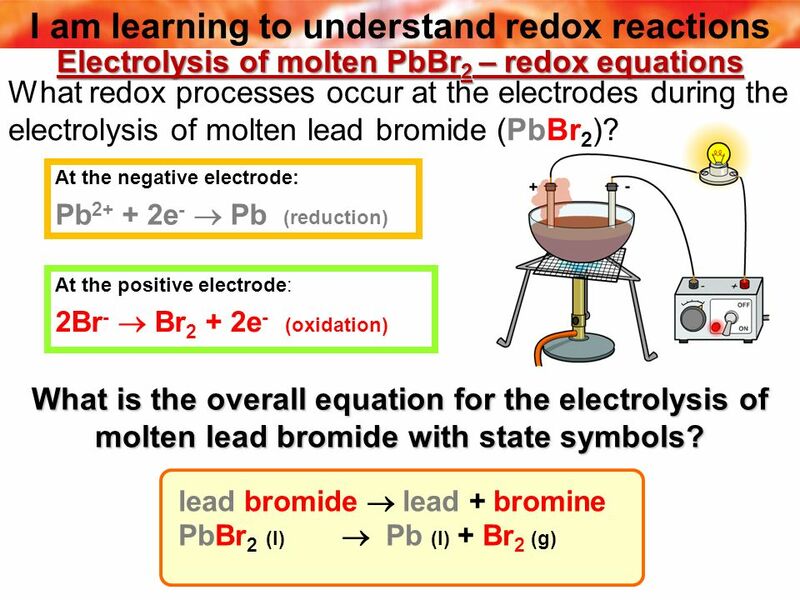 We need an Anode (to take electrons) Cathode (to give out electrons) Pb and Br ions. 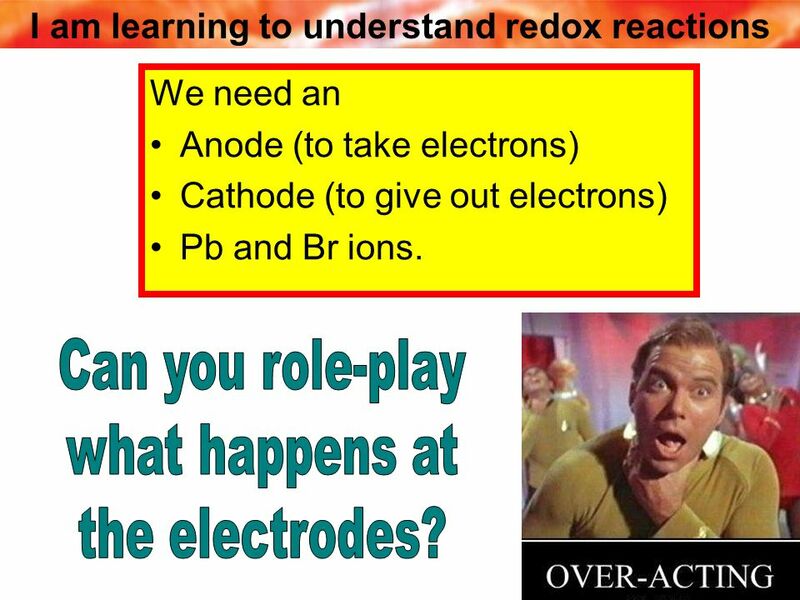 Can you role-play what happens at the electrodes? 19 How does water effect the products of electrolysis? Water contains hydrogen and hydroxide ions. When solutions of ions in water are electrolysed, hydrogen may be produced at the positive electrode. This happens if the other positive ions are metals more reactive than hydrogen. Whats the name of the positive electrode? 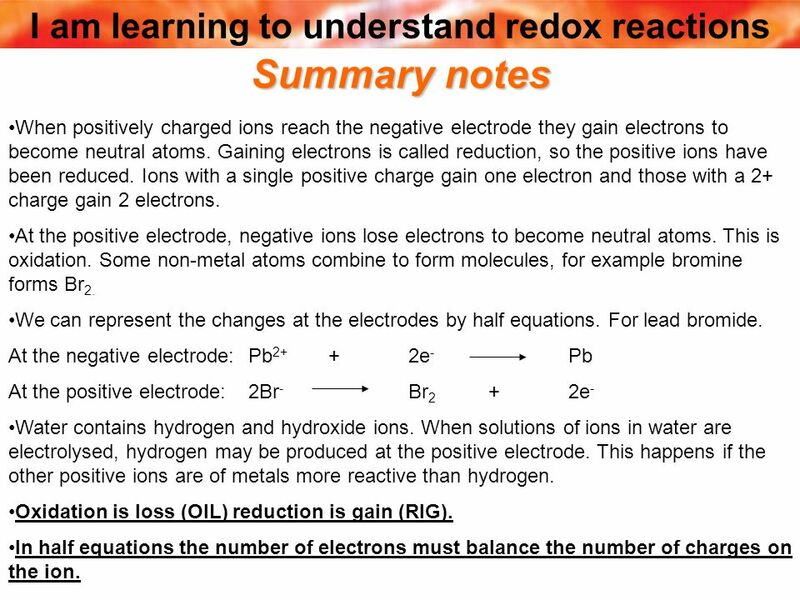 20 Summary notes When positively charged ions reach the negative electrode they gain electrons to become neutral atoms. Gaining electrons is called reduction, so the positive ions have been reduced. 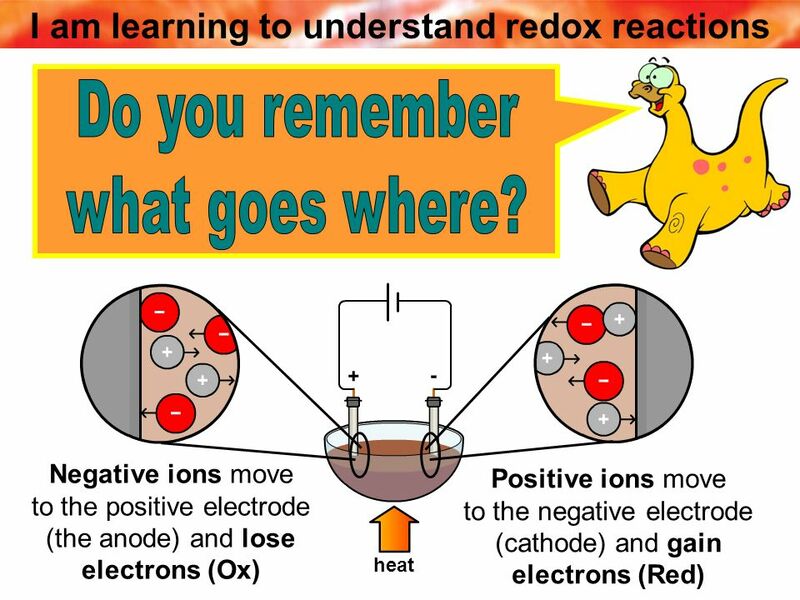 Ions with a single positive charge gain one electron and those with a 2+ charge gain 2 electrons. At the positive electrode, negative ions lose electrons to become neutral atoms. 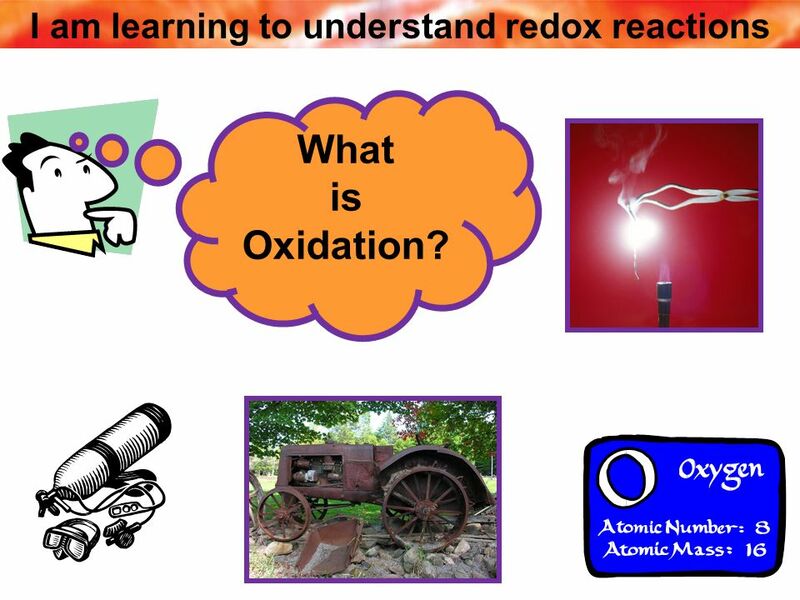 This is oxidation. Some non-metal atoms combine to form molecules, for example bromine forms Br2. We can represent the changes at the electrodes by half equations. For lead bromide. At the negative electrode: Pb2+	+	2e-	Pb At the positive electrode:	2Br-	Br2	+	2e- Water contains hydrogen and hydroxide ions. 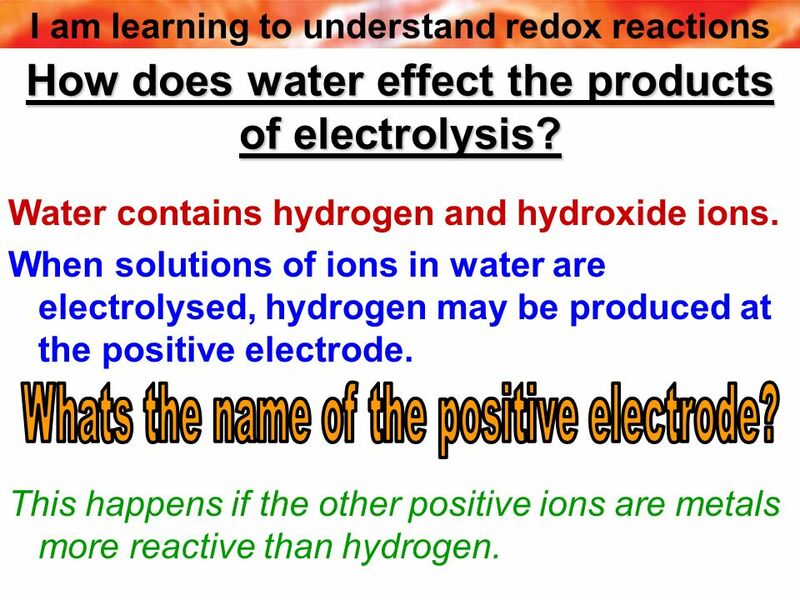 When solutions of ions in water are electrolysed, hydrogen may be produced at the positive electrode. This happens if the other positive ions are of metals more reactive than hydrogen. 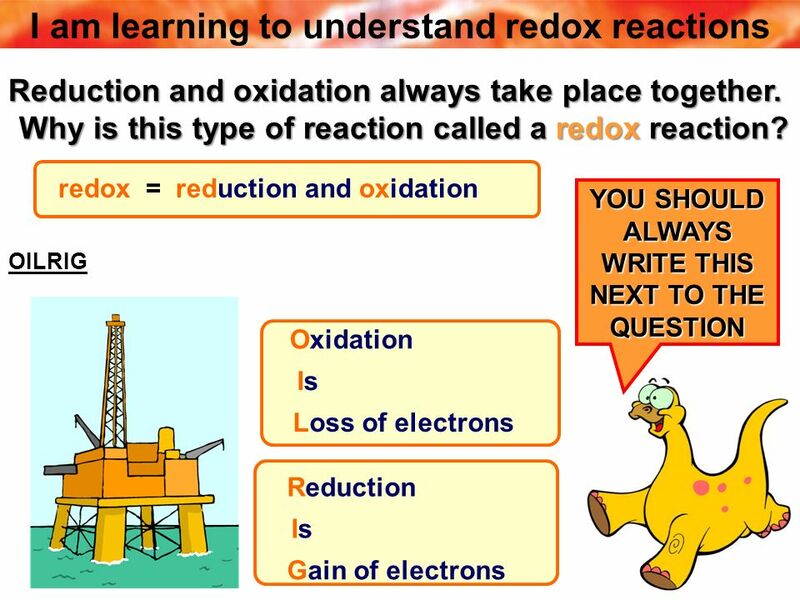 Oxidation is loss (OIL) reduction is gain (RIG). In half equations the number of electrons must balance the number of charges on the ion. 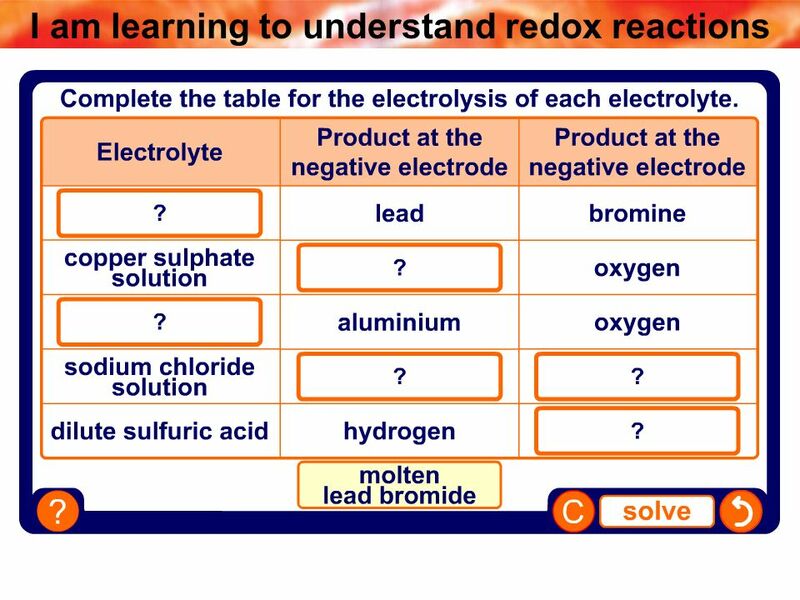 What happens in electrolysis to copper ions, Cu2+, at the negative electrode? What happens in electrolysis to chloride ions, Cl-, at the positive electrode? Why are ions of metals always reduced in electrolysis? 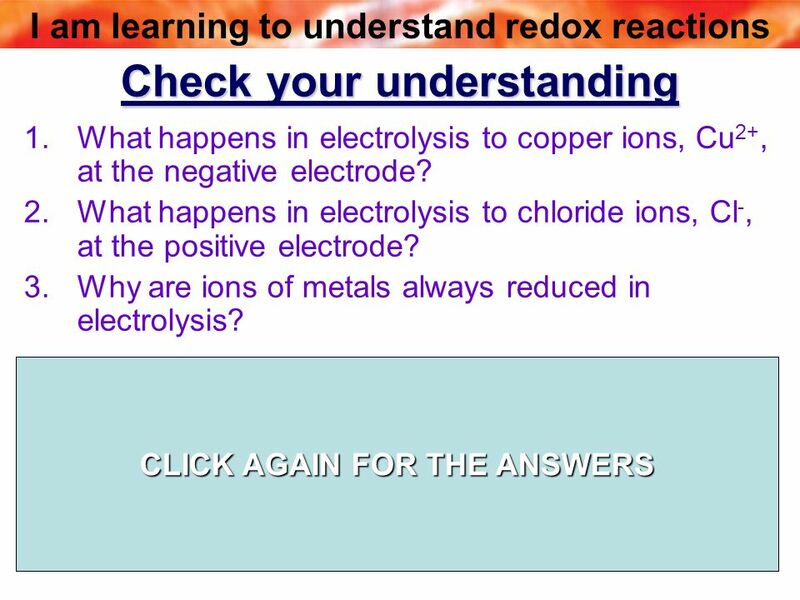 CLICK AGAIN FOR THE ANSWERS ANSWERS: They are discharged, gain electrons and are reduced to form copper atoms. They are discharged, lose electrons and are oxidised to form chlorine atoms which then bond to form chlorine molecules (diatomic molecules) All metals form positive ions so they are attracted to the negative electrode where they gain electrons. Download ppt "Changes at the electrodes"
Electrolysis of solutions solutions can be electrolysed; gases are usually produced gases produced can be collected in test tubes; identified later by. What is the name of the scientist who investigated the theory of electrolysis in 1830? Definition of Electrolyis Electrolysis is the conduction of electricity. Starter 1. What types of elements are present in covalent compounds? 2. What can be said about the conductivity of covalent compounds? 3. What types of. 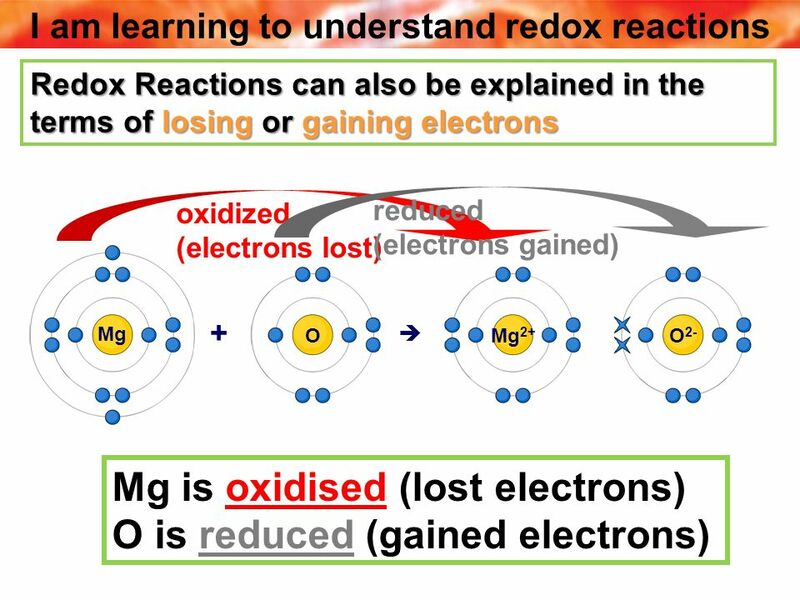 Electrolytic Cells use an external power supply to force a non-spontaneous redox reaction to occur. Electrolysis Of Brine Noadswood Science, 2012. Let’s read! Pages 82 to 89. Objectives To know how to carry out electrolysis experiments. To work out what happens to ions at each electrode. To be able. 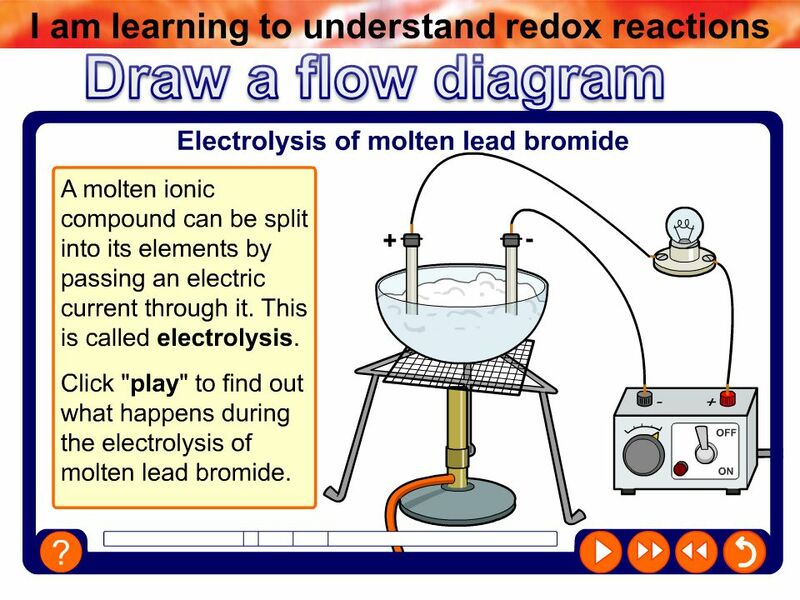 Electrolysis Electrolysis breaks down ionic substances into simpler substances by using electricity! 6. 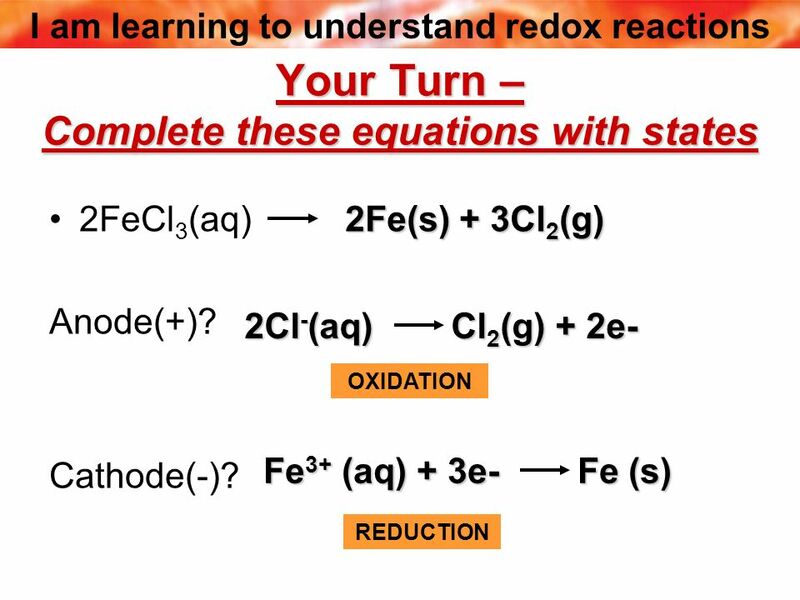 Electrochemistry Candidates should be able to: (a)Describe and explain redox processes in terms of electron transfer and/or of changes in oxidation. 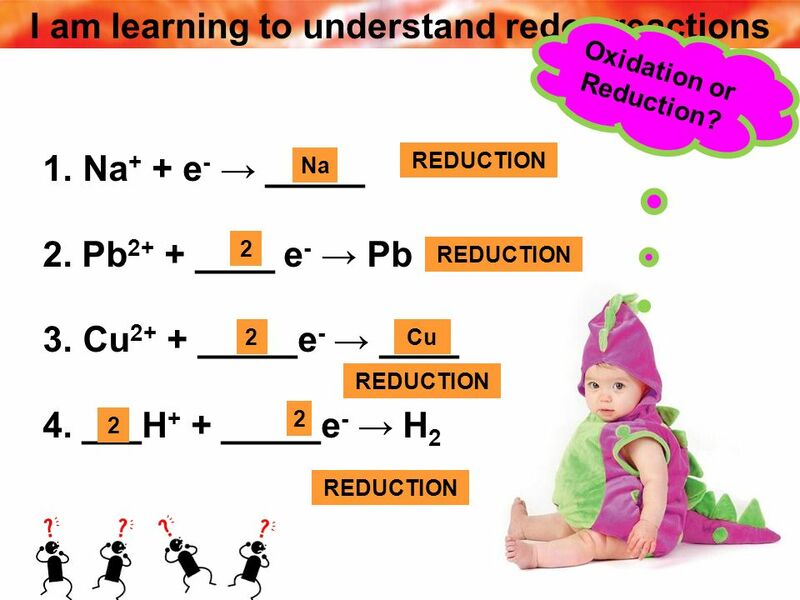 Topic 9 Oxidation and Reduction Introduction Oxidation numbers Redox equations Reactivity Voltaic cells Electrolytic cells. 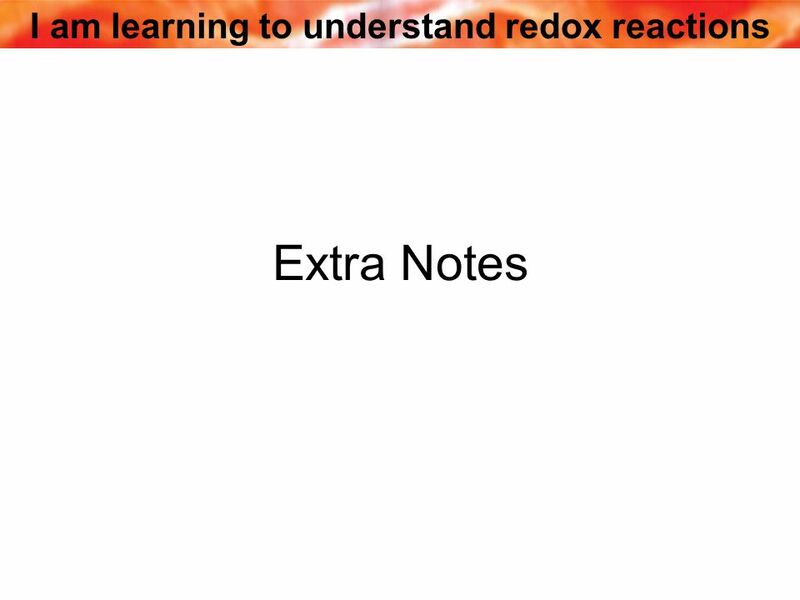 I am learning to understand redox reactions EXAM TIPS: You may be asked to apply your understanding to industrial processes such as hair removal, plating. VIII. 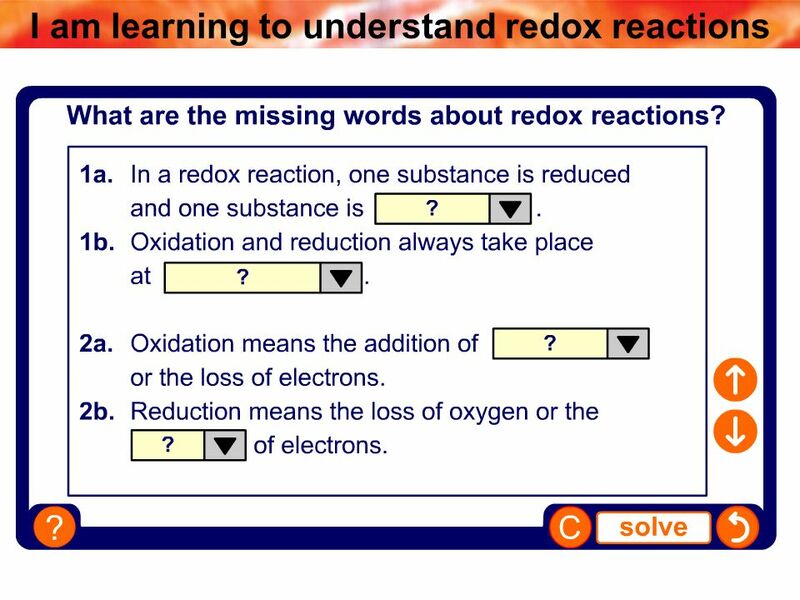 Oxidation-Reduction J Deutsch An oxidation-reduction (redox) reaction involves the transfer of electrons (e - ). 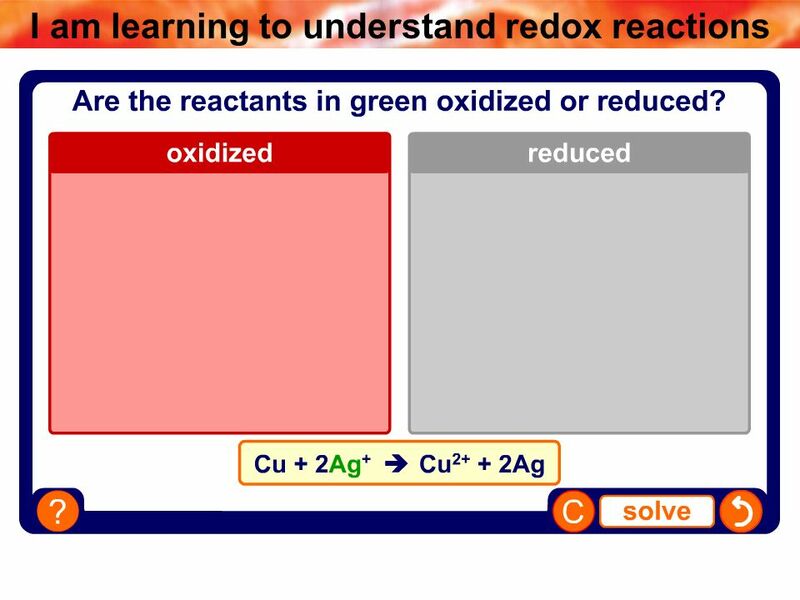 (3.2d) The oxidation numbers. DAILY QUESTIONS Circle the oxidized element, underline the reduced element. 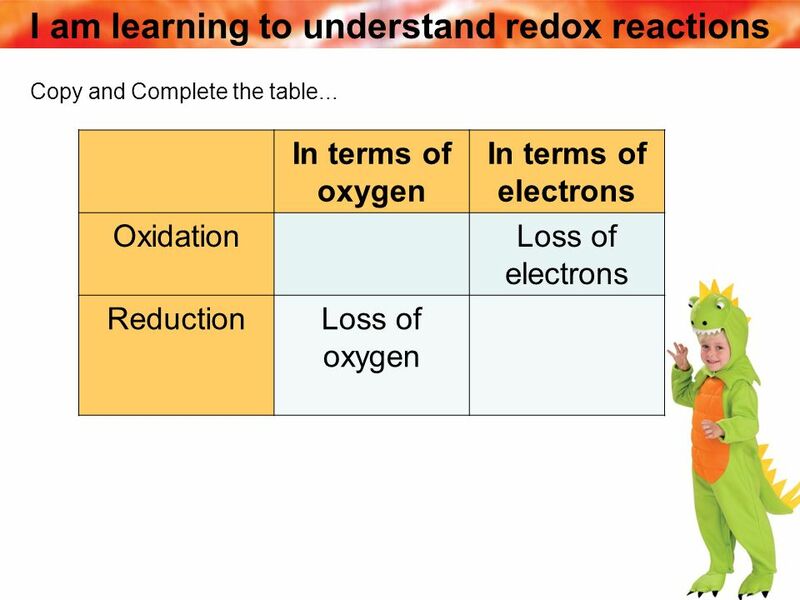 2Sr +O 2  2SrO Fe +2 +O 2  FeO Define what happens to elements that are oxidized. 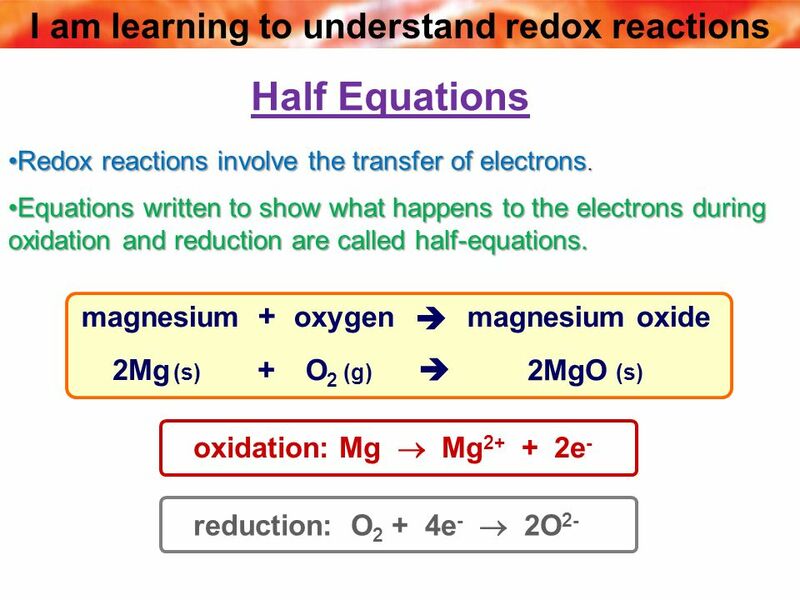 Redox reagents, equations, titrations, and electrolysis. 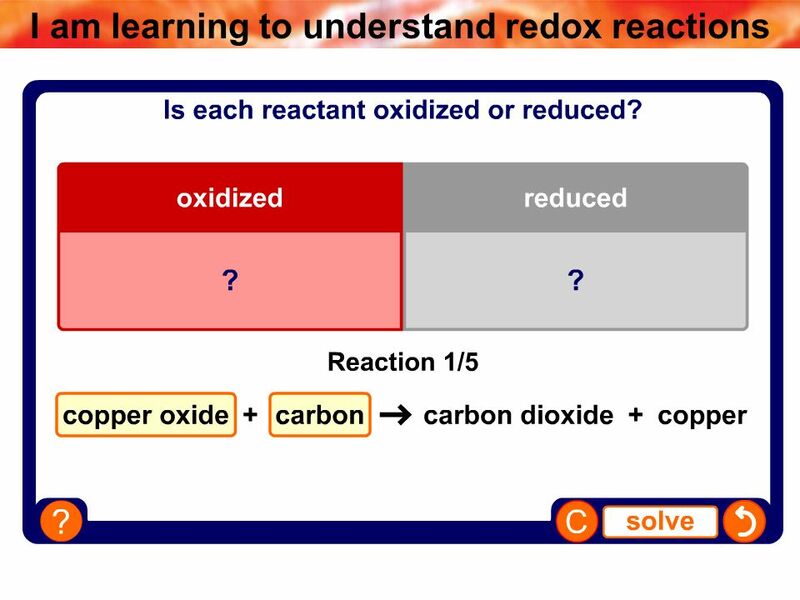 Redox Reactions What is oxidation? What is reduction? 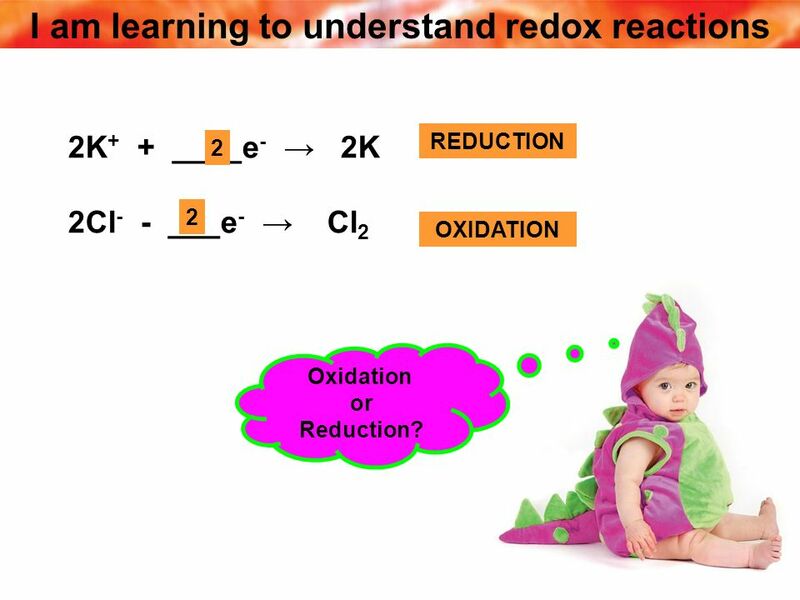 Redox reactions. 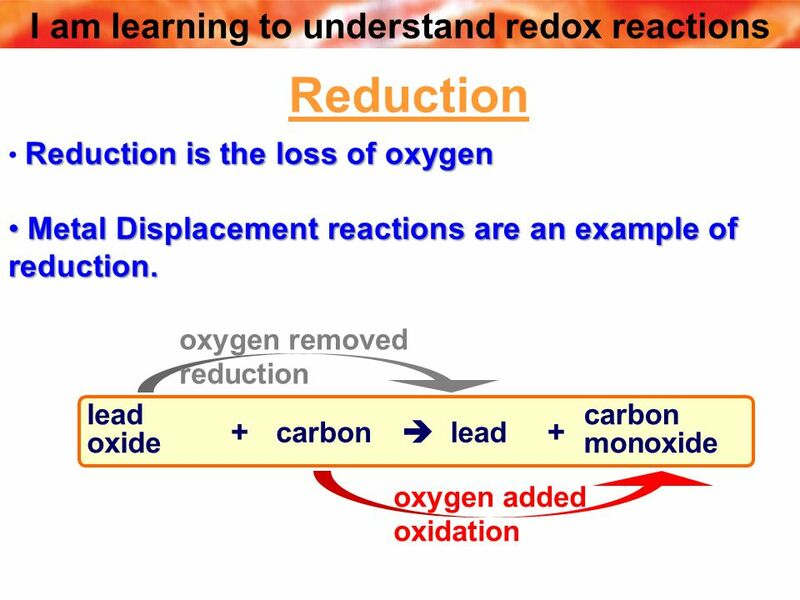 Definitions of oxidation and reduction Oxidation.